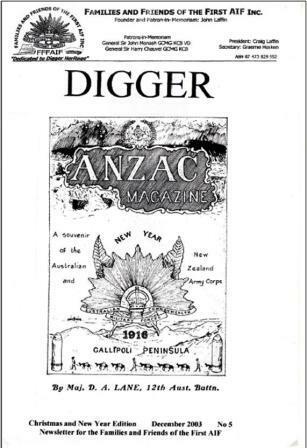 DIGGER magazines 1-9 were edited by the associations founding President Craig Laffin. 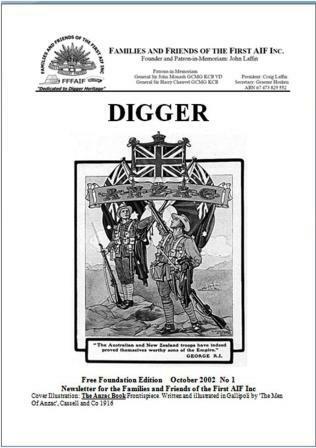 The foundation issue of DIGGER magazine was published in October 2002 and from humble beginnings has developed into a comprehensive publication covering Digger heritage. 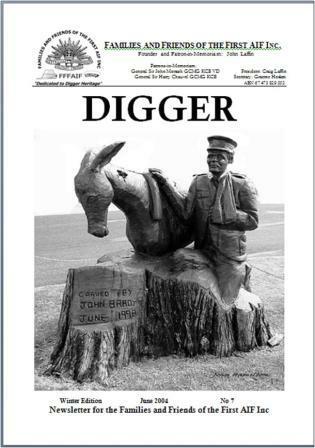 It is a wonderful privilege to initiate DIGGER as the newsletter of our newly incorporated association which is Dedicated to Digger Heritage. My Father, Australian military historian and author John Laffin, proposed the creation of the FFFAIF and a group of dedicated supporters met in early 2000 to implement his concept. Unfortunately with my Father’s death in late 2000 plans for the FFFAIF were delayed until mid 2002 when an enthusiastic planning group formed to establish the association. The FFFAIF honours the memory of three great Australians as its Patrons – in- Memoriam. 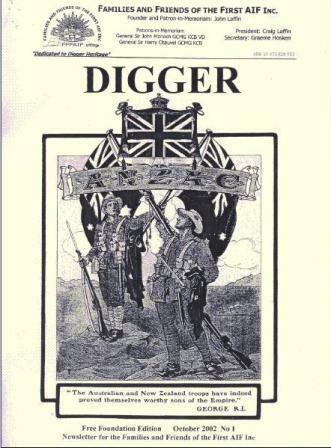 John Laffin is honoured for his lifelong endeavours to commemorate the Diggers of WW1 and for founding the FFFAIF. Generals Sir John Monash GCMG KCB VD and Sir Harry Chauvel GCMG KCB are honoured for their commanding and inspirational leadership during WW1. The FFFAIF is now open to general membership – for the Families and Friends of the First AIF. 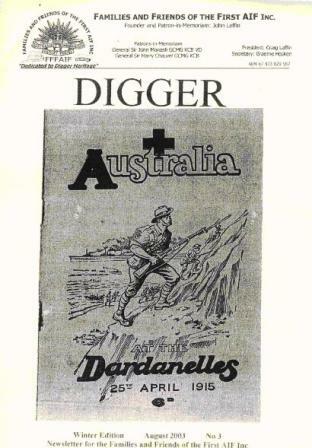 This free foundation newsletter includes membership application details and provides a practical means of commemorating Digger Heritage. 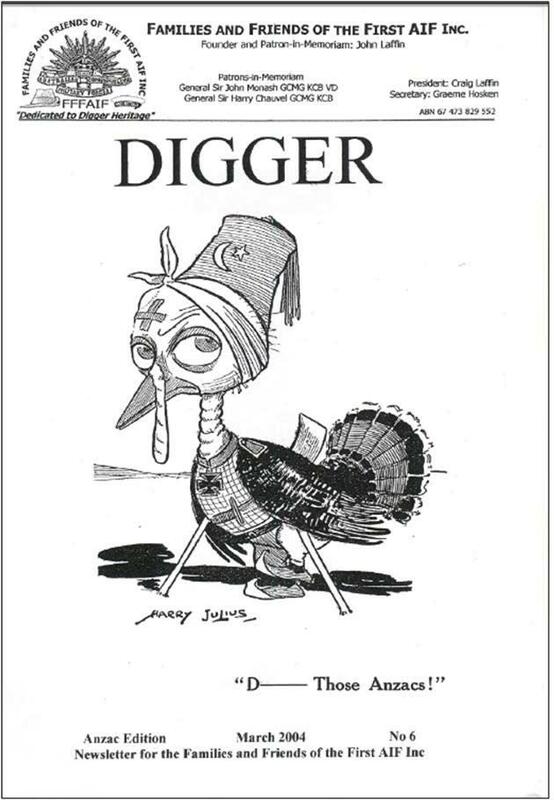 I hope you enjoy and are interested in the mix of information, stories,poems and illustrations which comprise DIGGER. 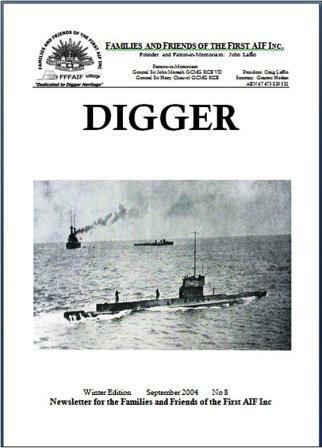 Future editions of DIGGER will include Correspondence; please write to the Editor with your comments and queries. 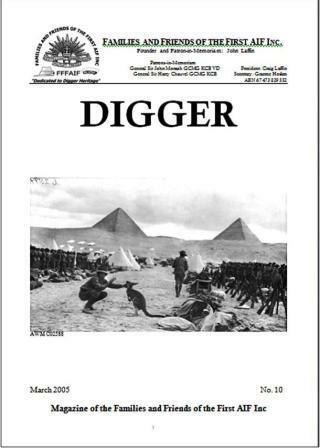 You are welcome to submit articles/anecdotes and other material for consideration by the Editor for publishing in DIGGER. Location: 99 York St, Sydney CBD, Level 2 (enter via public lobby and then take the lift). “Captain Edwin Cowan, MC**, RFC, killed in action November 1916, aged 18 years: a biographical sketch using archival material”, Paul Simadas. Sydney Jewish Museum, NSW Jewish War Memorial, 148 Darlinghurst Road, Darlinghurst. The ceremony will take place in the presence of their Patron, His Excellency General The Honourable David Hurley AC DSC (Ret’d) Governor of NSW, together with Mrs Hurley and the Occasional Address will be given by the State Governor’s immediate predecessor, The Honourable Dame Marie Bashir AD CVO. FFFAIF is invited to lay a floral tribute. RSVP 17 April. 31 December 1914 The second convoy of the First AIF departed Albany Western Australia. 9 January 1917 Light Horse captures Rafa.